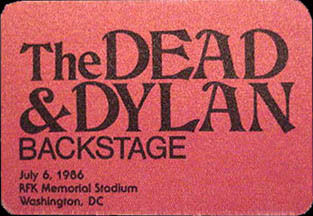 Any time to see the Grateful Dead was a great show automatically. However donning my critic hat for a sentence or two I gotta say average rating is generous. The pace of the show started off bad with Weir’s then new wireless system not workin and he got pissed off and made references to it on the mic many times throughout the sets. Couple that with Garcia’s oncoming collapse phase 1 clearly starting to show and the DC sweltering heat raining down upon RFk. Still over all once the show got its footing a good time was still had by most all.